With his days of protest long past, Joe Coffee tells his wife, Jane, one day that he’s thinking about running for Congress. She sets his whim in motion and they get his name on the balloe in a rural western Iowa district. “Coffee Joe,” as he becomes known, speaks out against prisons and the military and no one takes him seriously at first. But when his campaign begins to resonate with voters, terrified establishment politicians try to stop him. In a dramatic conclusion, Coffee Joe becomes a central figure in a hostage crisis involving disgruntled farmers. 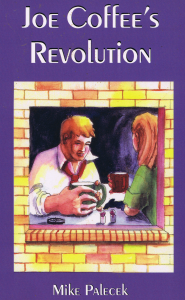 In an era of war in the Middle East and a conservative approach to the economy, Joe Coffee’s Revolution provides a refreshing alternative perspective. Mike Palecek, the author of several previous books, grew up in Norfolk, Nebraska. He was a paper boy like Joe Coffee as well as an altar boy and seminarian. He served time in federal prison after he was arrested for trespassing during a protest at Offutt Air Force Base in Nebraska. Like Joe Coffee, he also ran for Congress.